Shelby Farms Greenline is a 10.65 mile paved, urban trail that connects pedestrians and cyclists in Midtown Memphis through Shelby Farms Park to Cordova. 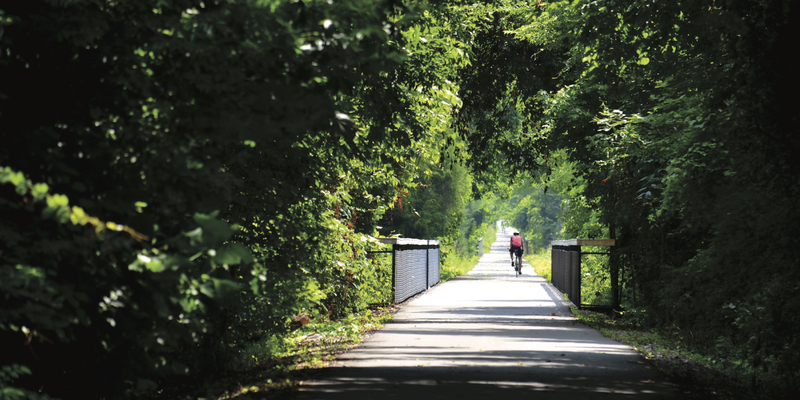 The Greenline is a rails-to-trails project that transformed an unused railroad line into one of Tennessee's favorite trails. The Greenline runs from Tillman Street at Walnut Grove Road in Midtown to B Street at Macon Road in Cordova. There are access points at Tillman Street, HIghland Street, High Point Terrace, Graham Street, Waring Road, Podesta Street, Sycamore View, Farm Road at Mullins Station Road, Whitten Road, Appling Road, Raleigh LaGrange Road, Germantown Parkway, Cully Road, A Street, and B Street / Macon Road at the Cordova Depot. If you want to hit the trail on a bicycle, bring your own or visit our Greenline Bike Rentals. Need to do some minor repairs to your bike while you're on the trail? A free bike repair station is located on this trail at the 0.0 mile marker at the corner of Farm Road and Mullins Station Road! You may run the Greenline, but did you know the trail runs on your support? Shelby Farms Greenline doesn't run on tax dollars -- it runs on support from the community! Thanks to help from corporate supporters like Campbell Clinic Orthopaedics which sponsors mile markers along the trail, and individual contributions from Park Members and donors, the trail is thriving, but we could still use your help! To help ensure that the trail you love has a bright future, become a Park Member today or register to run the Shelby Farms Park 10-Miler + 5K!